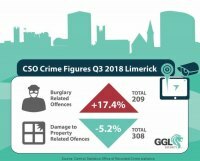 The latest figures released by the Central Statistics Office for the Limerick Garda Division are showing a continued rise in burglaries for the county but a decrease in offences for damage to property. Burglary and related offences are up 17.42% in Q3 of 2018 in comparison to the same quarter the previous year. That’s an increase from 178 to 209 burglary offences in relation to Limerick City and County. For the 12-month period up to the end of the third quarter of 2018, burglary offences were up 18.49% overall (up by 145 offences from 784 to 929). Better news however indicates that damage to property and the environment offences were down 5.23% in the third quarter of 2018, reduced from 325 to 308. This is obviously good news for Limerick property owners however the overall figures for the 12-month period up to the end of the third quarter show a rise by 6.8% (from 1250 to 1335). “It is concerning to see the rise in burglaries for the third quarter of 2018 which includes the summer months. This rise is consistent with the previous three quarters which means burglaries have increased over all 12 months. We always advise people to be extra vigilant about their security while properties are vacant, especially during holiday periods, and this should be kept in mind facing into the Easter break. Everybody must take some steps themselves to make it more difficult for the criminal to succeed.